Weatherby has a new modular rifle for PRS comps and other tactical disciplines. Called the Vanguard® Modular Chassis (VMC), this rifle features a Modular Driven Technologies (MDT) aluminum stock, Luth AR MBA-1 buttstock, and 22″ heavy barrel. 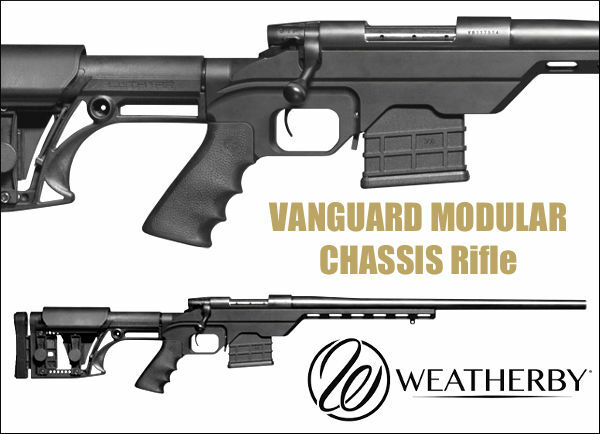 The Weatherby Vanguard action is fitted with an adjustable 2-stage trigger. Priced at $1519.00 MSRP, this rifle can be campaigned in the PRS “Production Class”, which limits complete rifles to $2000.00 without optics. The rifle is offered in three chamberings: .223 Rem, 6.5 Creedmoor, and .308 Winchester. It turns out Weatherby’s accuracy claims are conservative. This tactical rifle is closer to a half-MOA rig than a 1-MOA gun. 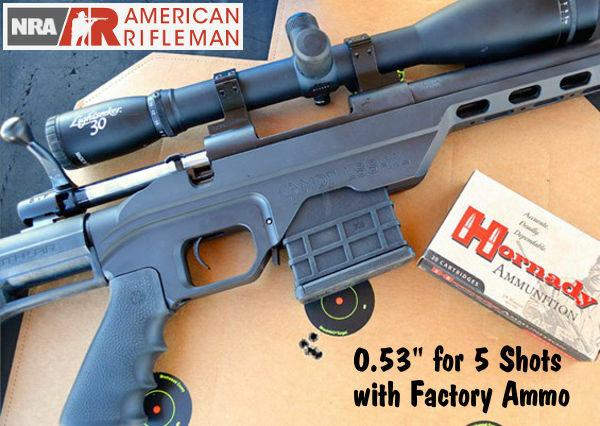 American Rifleman recently tested a .308 Win version of this rifle and recorded really stellar accuracy — close to half-MOA. What’s more, this rifle is not fussy — with a 1:10″-twist barrel it proved very accurate with six different types of factory ammo. In fact, the rifle delivered near-half-inch 5-shot groups with two types of Hornady factory ammo, and the worst group (of six ammo types) was 0.76″, still very impressive for factory fodder. With good hand-loads this gun could go well under half-MOA (for five shots). Share the post "Vanguard Modular Chassis Rifle — Half-MOA with Factory Ammo"